Pudding Pie. I just love the sound of it. What I did not know is that I would love this simple pie so much that I don’t know why I have never really thought of making something like this. I’ve told you that I have had some sweet tooth, pretty much since July or August and I am constantly, or least it seems as though, thinking of sweets. So one afternoon before my kids got home from school, I decided to rummage through my freezer and cabinet thinking of things to make. Remember…. something sweet. I found a frozen pie crust, a crust I probably purchased because I was thinking of sweets, and then I found a box of chocolate pudding. I love pudding. Cold pudding. Anyway I brought both of them out and thought, heck, why not come up with a pudding pie! We love those French Silk pies from Baker’s Square (sometimes) and this is what I was probably thinking when I saw the two simple ingredients. This pie was not only simple to make but good grief was it delicious. Again, this is way too easy. Bake the crust. Make the pudding. Let the crust cool. Add the pudding to the pie crust. Smooth it out. Cover and place it in the refrigerator to get nice and cold. When you are ready to serve, take a nice slice, add a dollop of Cool Whip to the top and crumble graham crackers over the top. Trust me, you need the graham crackers. 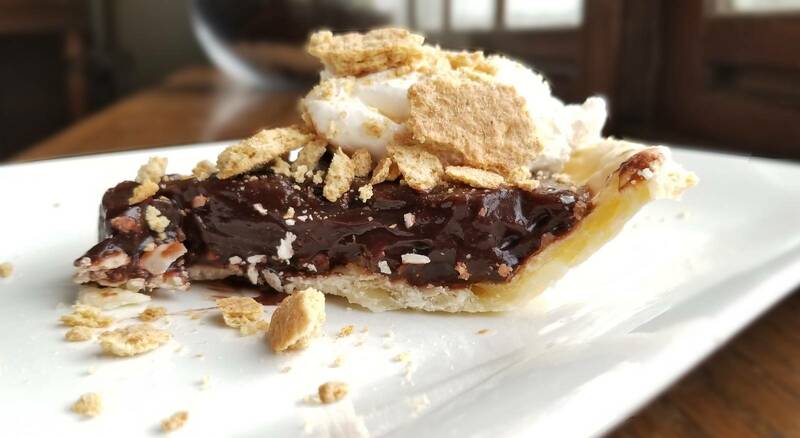 They add a great crunch to the nicely cold chocolate pudding pie. The kids were happy, I was happy, and my oldest who was home skiing from college that night ended up taking half of the pie back to school with him. It was good. It was really good. Hope you enjoy!